I read that San Marzano makes delicious sauce so decided to grow them this year. Hoping for a bountiful harvest. 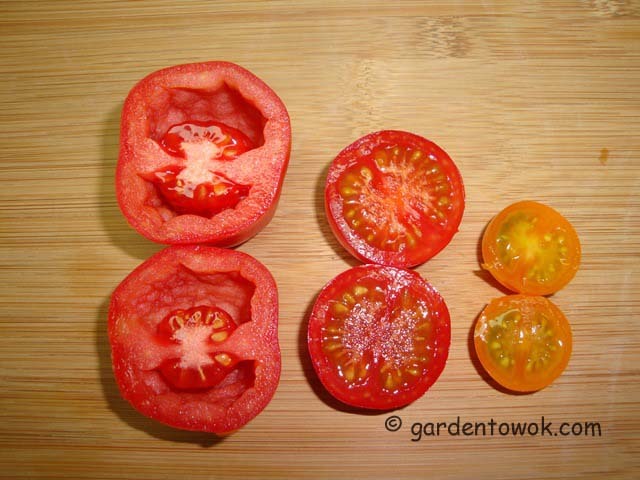 Stupice Heirloom tomato is an early variety and the tomato is supposed to be 2 – 3 inches across. The largest of mine was only 1½” across, not much larger than a cherry tomato. May be it is because I planted it in a container. Would a larger container give bigger tomatoes? Don’t know. This is the first time I am growing this variety, don’t really care for it as the skin is quite thick, but for a first slicing tomato of the season it is not bad. Will try a different early variety next year. Decided to plant my Ping Tung eggplant in container this year and did not have any flea beetles damage. On the plants there are quite a few baby eggplants and lots of flowers. Planting in container was a good decision. Planted 2 plants in a 20″ x 14″ x 13″ foam ice chest. Both plants are doing well but appear a bit crowded. Will put only 1 plant in the container next year. The small plant under the eggplant is thyme. Read that thyme is a good companion plant for eggplant. Wondered if that is the reason I do not have flea beetles damage. This is also a first. A late first, but better late than never. It was a challenging and interesting week as a result most of the above harvests went into the fridge or shared with friends. Pulled up my spring planted sugar snap peas plants. Enriched the area with composted cow manure and organic granular fertilizer and transplanted the sugar pod seedlings I started in 4-inch pots on July 8. First time replanting the same thing in the same location. Am I making a mistake? Will find out soon. Ending post with this beauty! 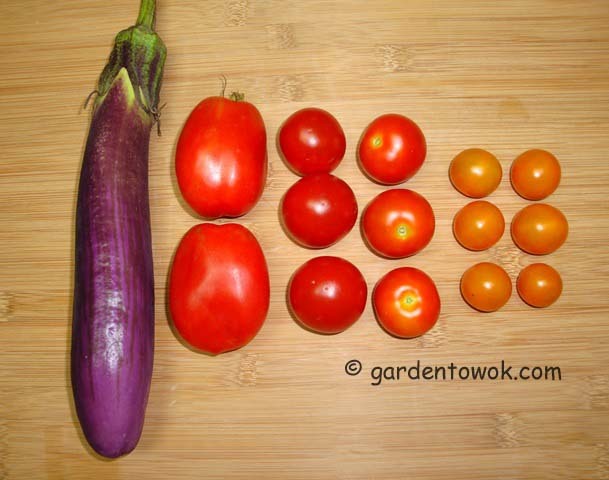 This entry was posted in Gardening, Harvest Monday, Uncategorized, Vegetables and tagged Chinese (garlic) chives, Chinese chives flowers, kohlrabi, Ping Tung eggplant, San Marzano tomato, snap peas, stupice heirloom tomato, sugar pod peas, sugar pod seedlings, sun gold. Bookmark the permalink. I love that purple kohlrabi! 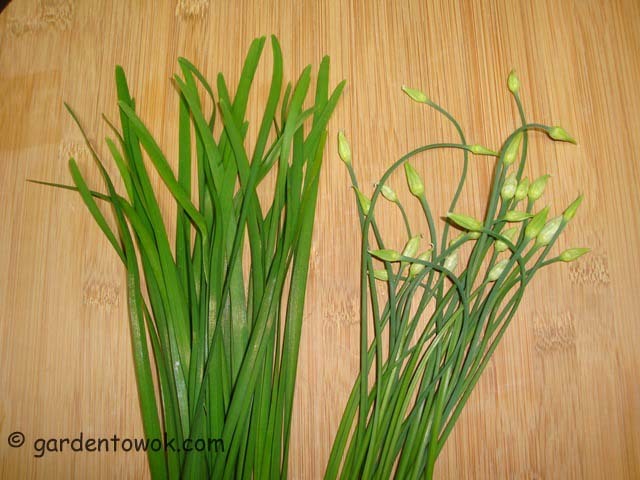 Chinese chives I grew last year were so tiny…not sure why..maybe they didn’t get enough sun? Were your Chinese chives first year planting? They should be bigger the second year, not enough sun will affect their growth also overcrowding. I haven’t had much luck with tomatoes until this year – not sure why and my garlic chives always seem to do well. Have a wonderful week ahead Norma. Glad you are having luck with your tomatoes this year, did you plant them in a different location? If you think back and note what you did differently this year you will be guaranteed success in future years. A wonderful week to you too. The change in soil is what helped the better weather is a factor also. My grandparents grow tomatoes but they are never like this 😛 So ripe and fresh! I am sure your grandparents tomatoes will be ripe and fresh if you refrain from picking them before they are ready. San Marzano tomatoes are one of my favorites for making sauce. I’ve had a time with early blight this year and even though the San Marzano plants have leaves dying, they have still produced lots of tomatoes. I hope yours do well! Sorry to learn about the early blight on your tomatoes, all the problems we gardeners face. Glad you still had lots of San Marzano. Very nice harvest, and yes San Marzano doesn’t have as much liquid/seed which makes it perfect for sauces. Though i prefer to use other varieties as SM always come all at once and die off too quickly. I’d rather have vines that keep producing till frost. Thanks. I did not realize SM dies off quickly. However that would give my other tomatoes more room to grow. I do like the fact that they all come at once. That’s a nice Ping Tung eggplant. Fortunately, this year the flea beetles have not been too bad, maybe the nasty winter killed off a lot. My Ping Tung plants on the deck were untouched, but once they got transplanted in the garden, they started showing some damage. I kept them covered for a while. Now they seem to be big enough to weather the attack. Thanks, glad your Ping Tung are growing well. 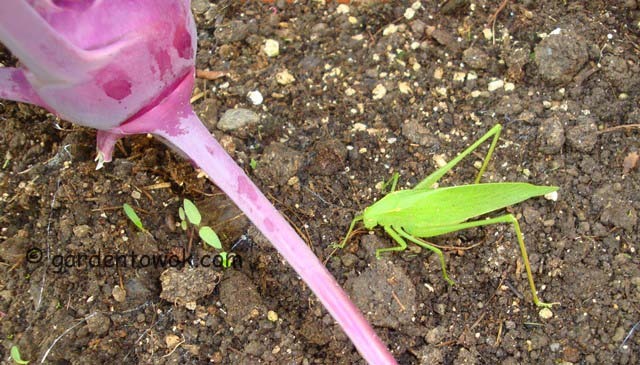 Yes, I think this past extreme cold winter killed off many nasty bugs, a good thing for us gardeners. Lovely harvests. How is the kitchen going? Have all your problems gotten taken care of? Thanks. I think/hope most, if not all, of the issues with my kitchen reno should be taken care of this week. I hope your remodel isn’t the reason why you gave away most of your harvests, that seems to be an unending project. Your harvests were lovely, the recipients are lucky to have you as a friend! The remodeling was part of the problem, hopefully all will be resolved this week. Lots like a nice harvest. Funny about the stupice tomatoes not getting very big. I’m having a similar problem with my shallots…half are about the size of golfballs right now and the other half are about the size of marbles. Hopefully the small ones will eventually catch up. Thanks. Are all your shallots planted in the same location? I find the same item planted at different location in the garden can make a big difference in growth rate. Norma they are planted in the same row with just four pepper plants between them…all with the same about of sunshine. It is almost like something is missing in the soil that surrounds them. I fertilized them again yesterday, I’ll see if that helps before it is time to pull them. It could be the pepper plants, with their roots spreading, are taking nutrients from them. Fertilizing should help. Love seeing how well your tomato plants are doing, Norma, as well as the rest of your garden. Using a container for your eggplants really did pay off for you. I’m not having any luck whatsoever with my tomatoes. This season. I may try a raised bed next year, though that will pretty much take up what little lawn I have remaining, I don’t have to decide now, thankfully. Look at the bright side, by making raised beds you will harvest tons of delicious vine ripened tomato for all your culinary needs and not need to mow lawn ever again. Very nice harvest this week, Norma and I envy you your tomatoes. I love that you used a foam ice chest as a planter! What a brilliant idea. I’m stealing that one next year. Thanks. The foam chest is light weight and was cheap, picked up a bunch on clearance end of last year at the garden center for $1.00 a piece. Glad you like the idea. Beautiful harvest! 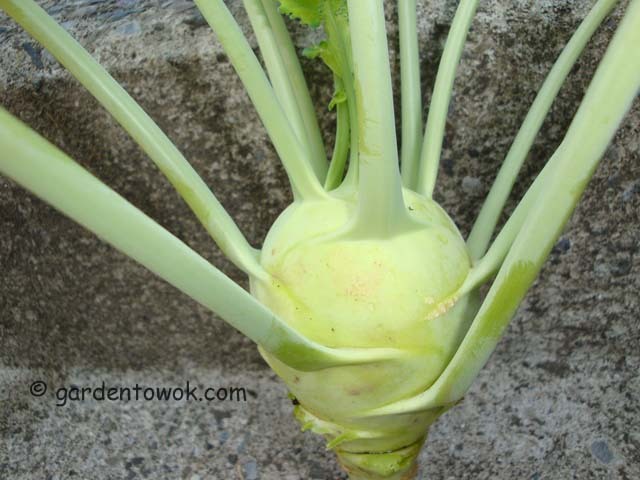 I am growing Pingtung eggplant as well and am finding it to be a great producer. And I like that the smallness of it is good for a single serving. Thanks. 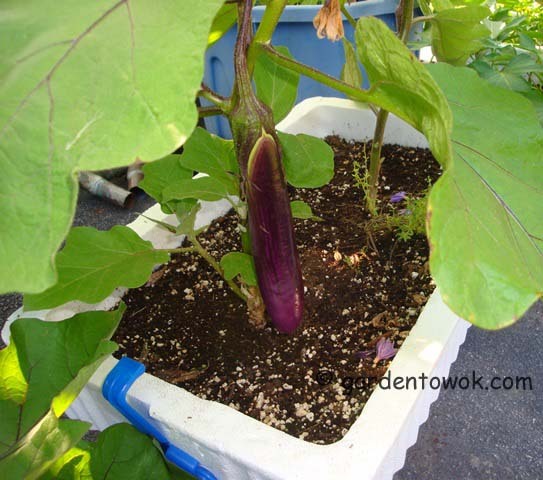 Ping Tung is one of my favorite eggplants, the texture is so silky. Hi Norma, Your tomatoes look wonderful, I have such a hard time growing them here. That’s a great idea to use a container for some of the plants you have trouble with, I will try that myself. Thanks! Thanks. I am really liking the idea of growing plants in container. I will be posting more about my window box and container gardening experiments in future posts. I’m grow Stupice for the first time as well, don’t care for the taste, but it’s the first to bear fruits and can be grown in a container. I have an eggplant growing in container it’s doing as well as the raised bed plants. Hope your kitchen returns to normal soon. I am not going to grow Stupice again, not worth the effort. I too do not care for the taste. The only problem with container plantings is the watering. Keeping irrigated all the time can be a challenge. Thanks for the compliments, not everything grows well for me, but whether it be success or failure I always learn something from the experience and always have fun. Thanks. Yes, some lovely dishes are in the future but first I need to get my kitchen and house back to normal. 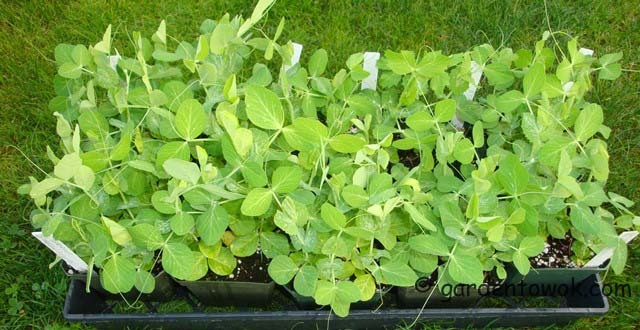 I’m going to be planting peas in the same spot that I just pulled the sugar snaps from as well. When I was trying to plan for crop rotation, I found it easier to stick with one type of veg (or one from the same family) in the bed for each season and then do crop rotations on an annual basis (instead of trying to incorporate multiple crop rotations into a single season). Of course, it’s not possible to do that with some beds like garlic & onions so I am replanting those with fall crops in the cabbage family just because it’s convenient. Glad you are successful with planting veggies of the same family in the same bed in a single season. Makes me feel so much better about my peas as now I know I will be getting good harvest. I’ve grown eggplant and peppers in containers before, but never in an ice chest. What a great idea! I think I grew Stupice many years ago but I can’t remember anything about the size of it. Thanks, glad you like my ice chest idea, a compliment from you means a great deal to me. Beautiful harvest, Norma! I think a sauce is a great idea for the San Marzano tomatoes. I could eat the heirlooms off the vine! Thanks. First time growing San Marzano, hope I get a good harvest to make sauce. Read about thyme as a repellant but not catnip, nice to know. San Marzano are the best tomatoes! I hope you get a great crop. 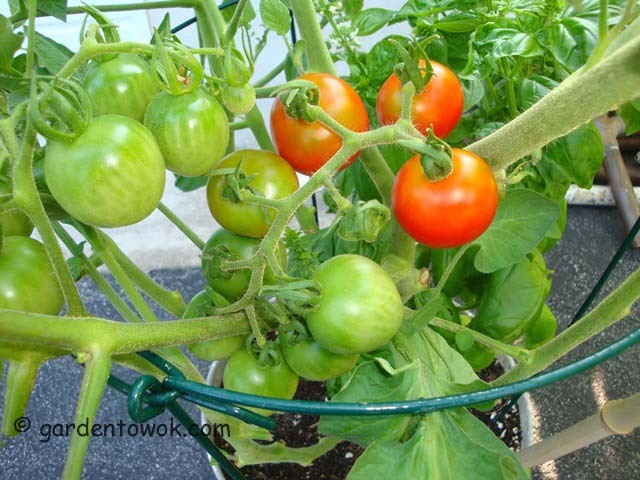 I think larger container and more frequent fertilizing will produce better results. Next year. I will trade some Chinese chives flowers for some of your wagyu beef. Fair, you have the complete harvest and more. But it is wearing such a pretty green. Yes I do have a variety of veggies to harvest. I tend to plant many different varieties but only a few of each due to limited space (and energy). What a great harvest Norma, the tomatoes look delicious. Wish I had planted some this year. Thanks. Nothing like homegrown tree ripened tomatoes. You have been busy with work where would you find the time to plant anything? I’d love to collect my own tomatoes. Norma, you rock! You motivate me to start my own garden and I will. Looking forward to reading about your garden. Theres nothing like fresh produce. I also grow vegetables. You might like my ‘What’s in my kitchen – August’ post and my lavender and lemon shortbread recipe. Take care. Emma. Thanks for visiting and taking the time to leave a comment. I just visited your post with the delicious scones and sceneries. I must get some big pots and give growing vegetables in pots a try. Your eggplant looks outstanding. You will have so much fun and enjoy the results.